As a correctional staff member, you know that the medical record is the link between the inmate’s care in the community and in the correctional institution. When a person enters the correctional facility, they do not give up the right to privacy or confidentiality. This course is designed for all non-medical correctional facility staff and will provide the correctional officer, unit staff, and program, recreational, education, or clerical staff guidelines regarding health information privacy or confidentiality issues in the workplace. When applying privacy and confidentiality regulations to a correctional environment, the goal is to find a balance between the needs and rights of the detainee or inmate as well as those of the staff and other inmates in the facility. 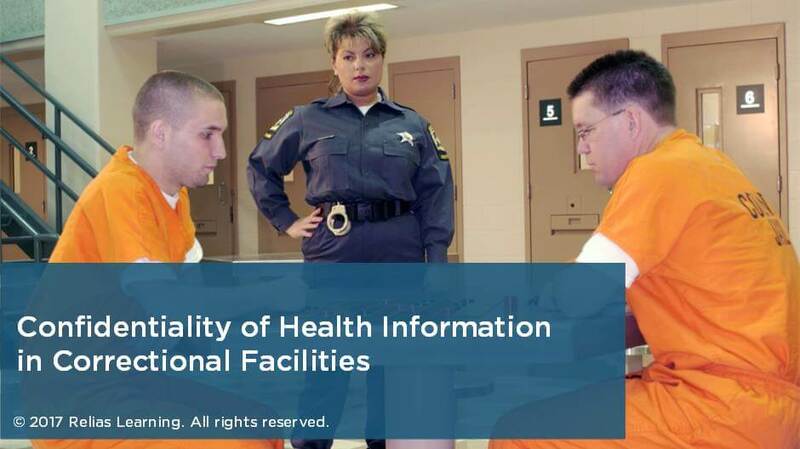 In this course, you will be provided with an overview of some of the laws and policies that govern privacy and confidentiality of health information and their applicability in correctional institutions. You also will learn about consequences that can occur when health information is disclosed inappropriately, the definitions of privacy and confidentiality, barriers to privacy in correctional facilities, and the type of health information correctional staff have a need to know. Define the term protected health information. Identify 3 rights related to privacy of health information. Describe 3 potential consequences of disclosing confidential health information of inmates, detainees, or residents. Identify 6 circumstances in which the Health Insurance Portability and Accountability Act (HIPAA) allows protected health information to be disclosed to correctional institutions and law enforcement. Determine incidents of possible breaches of confidentiality and privacy using case scenarios. Robert May II is the Assistant Director of Programs at IJIS Institute where he is responsible for helping to design and adopt standardized information sharing solutions on mission-critical information sharing in the law enforcement, corrections, justice, public safety, and homeland security sectors. He is a former Associate Director of the Association of State Correctional Administrators. Among his many responsibilities at ASCA, he served as the lead on the Reentry and Community Corrections, Intelligence and Information Sharing, and Substance Abuse and Mental Health committees. Disclosure: Robert May II has declared that no conflict of interest, Relevant Financial Relationship or Relevant Non-Financial Relationship exists. The target audience for this course is: entry and intermediate level Correctional Officers; in the following settings: Adult Corrections.